Hello everyone.. 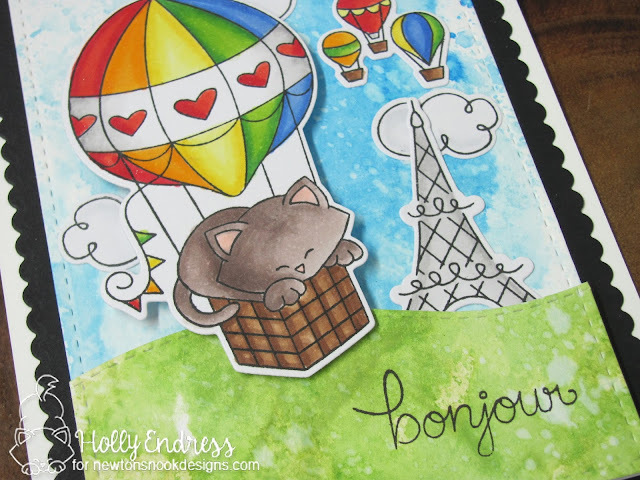 I'm up on the Newton's Nook blog today with a new video and this fun card featuring the Newton Dreams of Paris set. I started by creating a Distress Ink background on two pieces of watercolor paper using some Tumbled Glass and Salty Ocean Distress Ink and then Mowed Lawn and Shabby Shutters. I die cut both pieces with a small stitched rectangle die. Then I used the Newton's Nook Land borders Die to cut the hill from the Green panel. I adhered both panels together using some foam tape. Then I stamped each of the images onto some Copic friendly paper and colored them in and used the coordinating dies. I adhered the images with foam tape and Ranger Multi Medium Matte adhesive. Then I adhered the panel to a Black Scalloped Rectangle and added it to the top folding White card base. You can see more details on how I created this card in the video below.. Thanks for stopping by today... Head over to the Newton's Nook Blog for more inspiration! Oh this is Adorable. My youngest is Paris obsessed right now.Have a wonderful weekend!